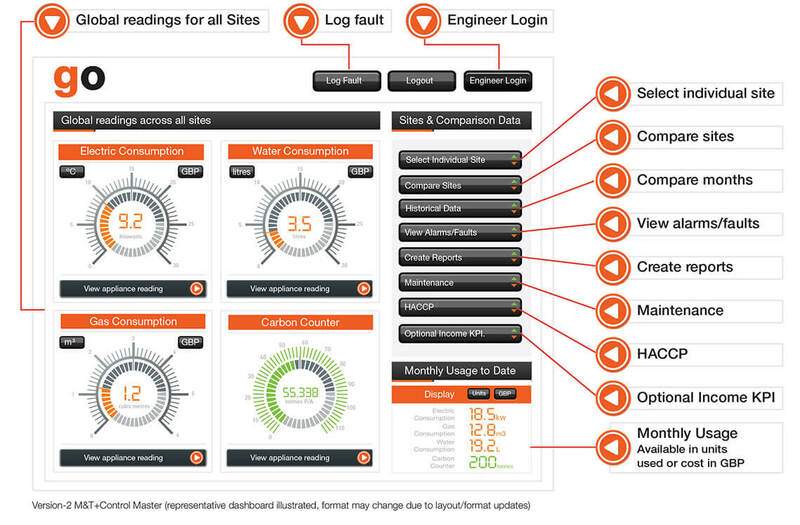 The energy optimisation service is able to achieve a reduction in site energy use with the benefit of providing other key benefits such as automated electronic temperature monitoring (HACCP) along with achieving maintenance efficiencies and reducing carbon penalties with the added benefit of 24/7 monitoring and control. This Green Optimisation service is based around reducing & monitoring energy usage whilst providing additional benefits in terms of enabling further cost and carbon reductions on a continuous partnering basis. A straightforward combination of design and project management enables a mix of high specification meters, monitoring equipment and wireless technology to achieve a fast and cost effective installation that will immediately link to the clients Green Optimisation dashboard. This dashboard provides live and up to date information that immediately creates a complete window of visibility on a sites activities & performance. This visibility normally creates an initial energy saving of between 10% and 20% and with further continued focus provides the control & visibility required to guarantee further savings.PLUS the system provides the added benefit of identifying further replacement systems/equipment which will achieve energy savings with a predetermined return on capital employed (ROCE). Please click here for full details of this innovative and cost effective service, why not consider controlling and reducing your sites energy usage? Use Green Optimisation to reduce energy use, reduce carbon emissions, automate temperature monitoring, reduce maintenance costs and support site reporting procedures.